The clinging power of the gecko! Every day seems to bring more news indicating that we will sometime soon see a real-life super-hero. The latest? Scientists have produced adhesive strips that work just like a gecko's, possibly allowing people wearing boots and gloves featuring the material to climb walls like Spider-Man. Now if only someone would just invent the ability to have the proportional sexual attractiveness of a spider, maybe we could all land supermodel girlfriends like Mary Jane Watson, too. Now that would be news-worthy! 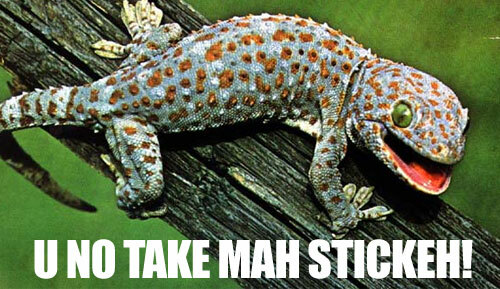 One Response to The clinging power of the gecko! Jeff! Great news about the “adhesive stripes”..Or…ummm… Stickers…Actually it’s not really great news for me, But in Guinness World Records 2007, theres this dude that climbs skyscrapers using no ropes, pulleys, or help of any kind, I think these stickers will come as a break to him, so on behalf of Captain Skyscraper (which is what I’ve named the climber dude) I thank all of the scientists who have worked on this project.